The first sniffings detect notes of black pepper and oak resin; aeration adds stone-dry scents of minerals, slate, and sage. The palate entry is lean, semisweet, intensely grainy, and satisfying; at midpalate the whiskey lies well on the tongue, sweet, grainy, medium plump, and spicy. Finishes spicy. 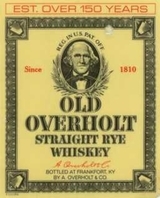 A very solid rye whiskey that deserves a larger audience.